On Saturday August 26th, Oldendorff Carriers Panamax team participated in the 35th Schiffahrtsregatta. The Schiffahrtsregatta is organized each year by Peter Gast Shipping GmbH and it is by far the largest regatta organized exclusively for the shipping community. This year 120 sailboats participated in the race with over 1,200 sailors. The race starts near Schleimunde, Germany and normally runs about 35 nautical miles across the Baltic Sea to Aroskobing, Denmark. This year because of light wind, the course was shortened to about 12 nautical miles. Johannes Babendererde from our Panamax Chartering team is a highly skilled sailor who sailed on the German national team. 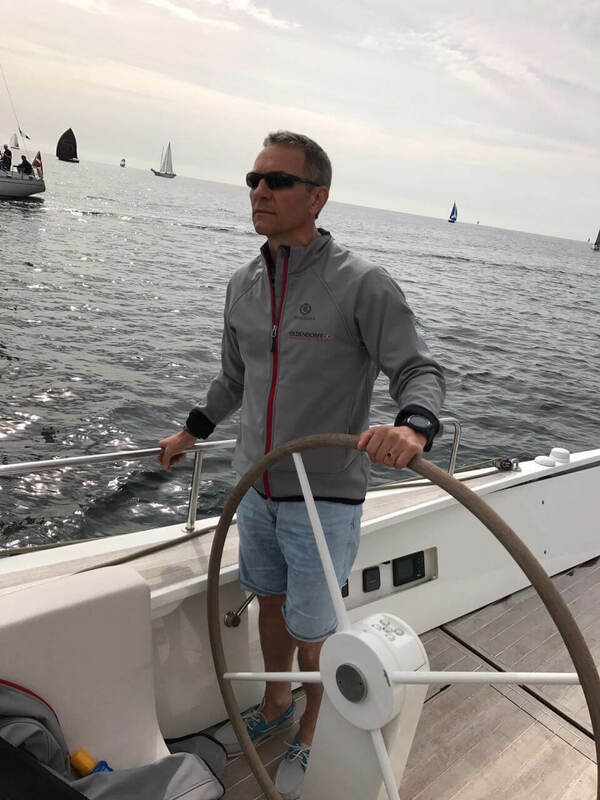 He has a close personal friendship with the owners of Knierim yard, Steffen Mueller and Gunnar Knierim, who agreed to join the Oldendorff sailing team and allow us to use their boat “Almost Nothing” in the regatta. “Almost Nothing” is a sleek, all white, 60-foot high performance sloop with a carbon fibre mast and spars. As the boat name suggests, the deck of “Almost Nothing” is very clean and uncluttered with no ropes showing. Determined to show that our team were true sailors, we sailed from Olpenitz very early in the morning excited to get started. Unfortunately, due to a lack of wind, the start was delayed by 3 hours. We used that time well to try different sail setups and to get used to the boat. Jibing under the gennaker turned out to be challenging at the beginning, but after a few jibes we came very close to perfection. We soon realized that in our enthusiasm to get started in the morning, we were so focused on sailing and winning that we forgot to load lunch on-board. We had to go back to the marina to pick it up from the harbour master boat who was kind enough to help us out. Our sailing crew consisted of 6 Oldendorffers, led by our very skilled Capt. Johannes Babendererde, 5 customers of our Panamax team and the two yacht owners. As one of the larger boats in the race, we started in the last group after the smaller boats. Our start was not great, we were in the middle of our group on the downwind leg. Rounding the first mark, we had already caught up to some of the smaller boats and we were second in our class. At the second mark we caught up to most of the boats, we jibed close to the marker giving us a good position to windward of the other boats on the last leg. This jibe created some anxious moments with our crew but allowed us to accelerate ahead of the other boats and take the good wind on the final leg. We received a very warm welcome in Aeroskobing, with crowds gathered at the entrance to welcome us in a festive atmosphere. Immediately upon berthing, we started our celebration, even before the official results were posted. At the award ceremony, "Fastest Yacht on the Course" went to Oldendorff Carriers' “Almost Nothing”. Our team was very well managed by our shore crew, Nadine Rosa, and lessons were learned to make us even faster in the future.